Reducing the potential for needle stick injuries to occur by providing information, training, personal protective equipment and responsive management. To provide mechanisms for the effective management of sharps in the community to maximise appropriate community sharps disposal. Community Sharps is a term used to define sharps that have been generated by non-clinical activities in the home or public facilities. This generally includes needles, syringes and lancets used by patients with diabetes or other medical conditions or injecting drug users. Community Sharps initiatives in Wagga Wagga are supported by Wagga Wagga City Council, the Pharmacy Guild of Australia, Kurrajong Recyclers, the Division of General Practice & Primary Health and the Greater Southern Area Health Service. 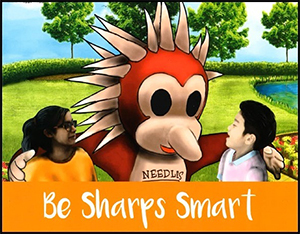 Join Needles and friends in an interactive session to learn what it takes to Be Sharps Smart! Wagga Wagga City Council has embarked on an innovative approach to engage, educate and help children learn about sharps. The book below has been published to educate children in identifying sharps and its dangers in open public spaces, helping children and the community understand the action that needs to be taken when sharps are spotted. Children learn to step back and tell an adult straight away. The community is also educated on the processes to follow should they observe or be notified of sharps in public spaces. When your container is full, secure the lid and deliver it to a needle & syringe outlet, or a Sharps Drop-Off Point. Store container out of reach of children. Do not dispose of sharps or sharps containers into general waste or recycling bins because of the high risk of needlestick injury to workers and other members of the public. Place all your injecting material in a sharps bin/chute in a public toilet or any other place that has a sharps bin. What can local businesses do? Arranging for a waste contractor licensed to safely remove and transport sharps waste. If you find a needle or syringe in a public space, please call Council or the Needle Clean up Hotline on 1800 633 353 to have the items safely removed. Most importantly do not attempt to pick up the needle or syringe. As soon as possible wash the area with soap and running water. Cover with a sterile dressing. Seek urgent medical attention at GP or go immediately to the Emergency Department of Wagga Wagga Base Hospital. To ensure sharps are correctly and safely disposed of in the community, a close partnership with local pharmacies in Wagga Wagga is established. As part of Council's Sharps Management Program, community sharps containers are located at local pharmacies, where they are kept in a secure location for customer use. This type of disposal service is generally convenient for customers who obtain their injecting equipment from the pharmacy. Remember, if you find sharps in public spaces, don’t touch it and call Council on 1300 292 442 or the NSW Needle Clean-Up Hotline on 1800 633 353. A trained person will collect and safely dispose the sharps. There are now 19 drop-off points located across the community, the following locations are available should you need to dispose of sharps or sharps containers in the Wagga Wagga area, please find a list of participating locations below. To find a sharps disposal facility or a provider of sharps containers near you, visit the Safe Sharps website www.safesharps.org.au to use the interactive map or download the smart phone app. You can also visit The National Public Toilet Map to search for those public toilets which include sharps disposal facilities.